The Urban Farming Guys do not set the bar low. Their mission is to establish sustainable communities in the most difficult places on earth. One such spot is the inner-city Lykins neighborhood in Kansas City. 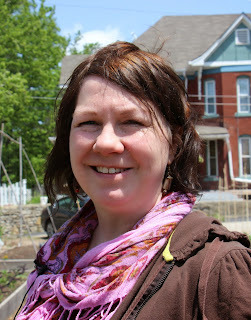 Candy Fields took me on a lively tour of their aquaponics setup. The Urban Farming Guys wanted to grow as much protein as possible in the smallest amount of space. They set a goal to grow 1000 pounds of protein with their small setup. It's a semi-closed-loop system. By this I mean that people feed the fish; the fish feed the plants; the plants clean the water. It is a little more complicated than that. 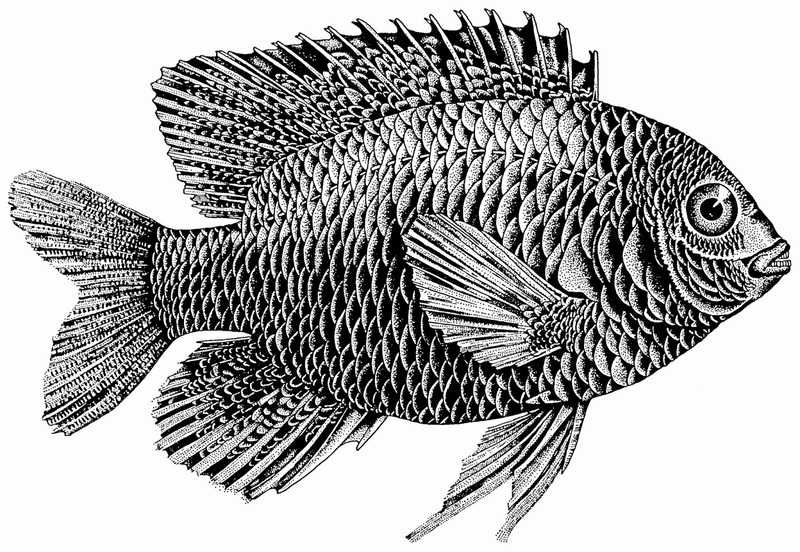 The Urban Farming Guys raise tilapia, a fast-growing fish, in tanks. The water from these tanks is pumped through the grow-beds every thirty minutes. 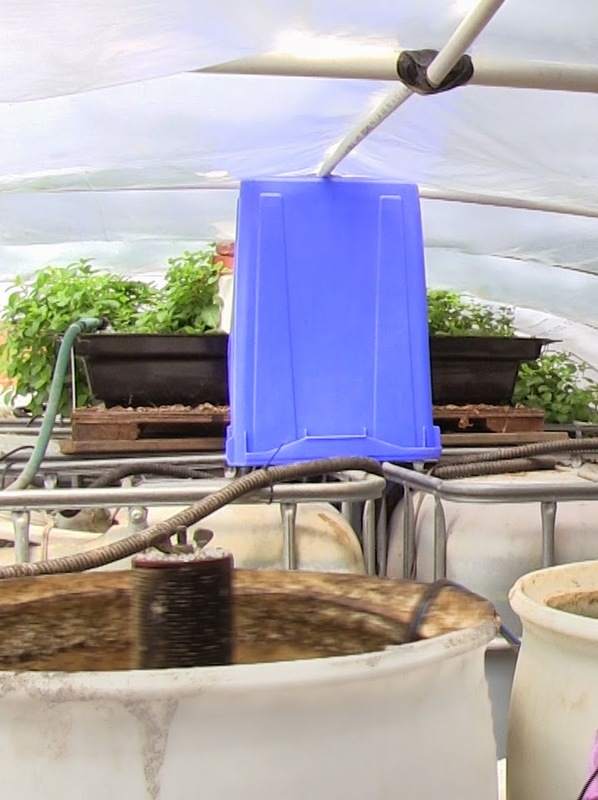 The water moves through a series of three filters after leaving the fish tanks and before heading up to the grow-beds. One of the filters discharges a rich organic fertilizer that is used in the outdoor gardens. 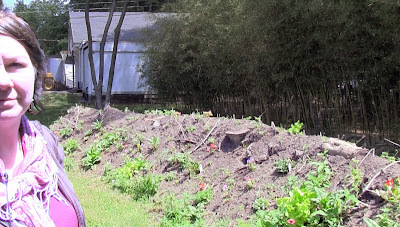 The grow-beds are simple baskets lined with rocks. As water from the fish tanks is pumped through these beds, it fertilizes the vegetables in the beds. The plants clean the water as they consume the nutrients. When the weather gets a little too cold for the fish, they heat the water. They grow basil, lemon balm, strawberries, eggplant, and lettuce amongst other things. But, do they use organic practices in such a setup? Candy says they don't use any chemicals to grow the plants. They don't have a problem with weeds, since they are growing hydroponically in a protected space. The first year, they had aphids, so they introduced ladybugs. Whether that took care of the problem or whether the ecology of the system adjusted as needed is unknown, but they haven't had aphid problems since. Other than a small problem with mold in the winter, they haven't had any problems with disease. 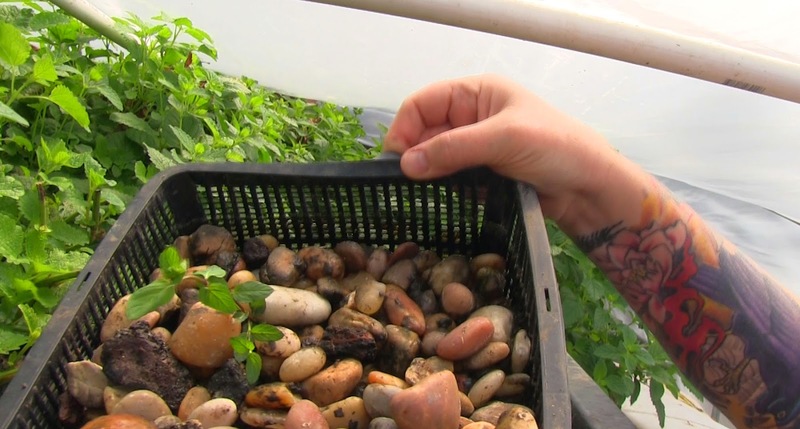 Candy says that in its fourth year, the aquaponics system has far surpassed their original production goal of 1000 pounds of protein; they are probably closing in on 2000 pounds. They have improved on their original design. They now help others get off the ground with the Barrelponics system. And they are looking to provide clean energy to heat the water and run the pumps with their own solar system. According to their website, hundreds of communities around the globe have requested their help with similar systems. They have built an aquaponic fish farm in an orphanage in Mexico. They also installed one in India, which is now growing winged beans so large that scientists have traveled over 1200 miles to check it out. The Urban Farming Guys also share their knowledge and skills with the surrounding Kansas City neighborhood. In addition to aquaponics, they teach composting, seed-saving, how to raise chickens, and other gardening techniques. I missed their weekly Saturday volunteer shindig. Every Saturday of the year volunteers meet at the farm for a group workday. Volunteers can work on a project and The Urban Farming Guys provide a big lunch and a tour. Even if you don't live nearby, you can come intern for a month or longer. This past year, Candy estimates that they hosted about twenty five interns. They are creating small micro-businesses, where the interns can work and learn. After gaining enough self-sufficiency, these interns can then take over the business, earning a percentage of the income. The Urban Farming Guys are bursting with micro-business ideas that they are turning into reality. With these businesses, they are excited about the prospect of supporting themselves without the need for supplemental jobs. They engage in worm-farming in a nearby cave. Several years ago, I got wind of a Kansas City company that was using a cave as an underground paintball arena. Now, I find out that the Urban Farming Guys are using a cave to turn up to 10,000 pounds of compostables into organic fertilizer every month, through the miracle of worm castings! And that's not all. They also run a fish hatchery. They are capable of hatching a few thousand tilapia every week. They have established a web store for the items that their followers have repeatedly requested. They are selling grow kits and aquaponics gear as well as promotional mugs, water bottles, t-shirts, and onesies. And, they are launching an urban CSA (Community Supported Agriculture). These are all game-changers in the inner-city, providing job opportunities and a more sustainable future. After the aquaponics tour, Candy took me over to the lot next door. Colorful beds line up in rows in this community garden. Last year, to make sure participants were invested in actually growing vegetables, they charged $5 or a day of volunteering for those who requested a bed. As it turned out, those that wanted to plant, planted. No incentive was needed. This year, it's free. And this year, the Urban Farming Guys also added drip irrigation lines to each bed, watering every other day. One of the beds is dedicated to strawberries. If you get hungry while you are gardening, you can come over and pick a sweet treat. But the real point behind this garden is to bring people closer to where their food comes from. Folks learn from each other and gain access to healthy food. A number of neighborhood kids have their own plots. The beauty of kids in the garden is that they deter would-be thieves. Who is going to feel okay about taking food from children? And the children are very likely to eat everything they grow! I would describe The Urban Farming Guys (UFG) as planting seeds in a community and then stepping back a bit to watch what grows. Candy told me a quick story of a notorious metal-scrapper criminal in the neighborhood. It all started, when he came and swam in their above-ground pool a couple of years ago. He wondered what they were doing, and after participating a bit, he decided to intern at UFG. Now he scraps metal legally for UFG, when there is any. His friends see what his life is like after pouring his energy into the farm. And some of them are interested in coming through the program. The wealth of knowledge that The Urban Farming Guys have brought to this Lykins neighborhood farm is well-matched by their zeal and follow through. I passed under a 25 kilowatt solar photovoltaic array, which they have guttered in order to harvest rainwater to supply the drip system to one of their garden areas. There were friendly interns at work along the way. Candy and I stopped in front of a long hugelkultur mound that they had built last year. One of the interns has taken over planting it with medicinal and culinary herbs, vegetables, and flowers. Candy got together with interested neighbors to raise chickens cooperatively. But after requesting and lobbying for zoning changes, most of the neighbors can legally raise their own. They have a truck that they want to convert into a mobile food truck. They would like to provide the folks living in the food desert that runs south of them with some healthy food options. It seems there is always one more project calling for their attention. The Urban Farming Guys are also creating an online community and Wiki database to tackle alternative energy, agriculture, construction alternatives, water technologies, permaculture, home-based do-it-yourself activities, and more. The aquaponics section is well fleshed-out and well-used. I think this reflects the potential of aquaponics. The Urban Farming Guys are especially interested in creating a sustainable future for those in the most desperate situations. And aquaponics holds great promise in that arena. In addition to the benefits already mentioned - no need for chemical inputs, no need for plant fertilizer, reduced damage from pests and disease, and no weeding - there are additional benefits. First off, aquaponics does not require any soil. In urban areas, the soil may be toxic. In areas where conventional agriculture has been practiced for many years, the soil fertility may be severely depleted. Highly acidic soils, highly alkaline soils, swampy land, hardpan, and straight sand are all conditions in which it is difficult to farm without heavy machinery or costly inputs. In impoverished areas, these can be barriers to feeding a community. Second, aquaculture provides protein in a very small space. Traditional farm animals need pasture in which to roam. The folks I visited at Shekinah Farm are looking to move to a larger farm in order to support their large animals. And, certainly, urban dwellers have only modest pieces of land to work, so growing protein is generally out of the question. When aquaponics enters the picture, the idea of growing protein everywhere becomes a possibility. In impoverished areas, lack of protein is a key deficiency, so a system that addresses protein production could help with malnutrition and hunger. James McWilliams is often quoted from his book, Just Food, "Over the course of a year, aquaponics will generate about 35,000 pounds of edible flesh per acre while the grass-fed operation will generate about 75 pounds per acre.” Even if these numbers are wildly exaggerated, there is a great deal of good protein to chew on with this statistic. Third, growing plants hydroponically uses far less water than conventionally grown produce. People bandy about the figure of 90% less water, but I have not seen specific research on this. Since the water is all recirculated and only a small bit is lost to evaporation and transpiration, I think it's fair to say that water use is drastically reduced, even without specific numbers. Conventional agriculture is depleting the world's aquifers at an alarming rate. Drought ravages many corners of the globe. A food-growing system that dramatically reduces water usage couldn't come at a better time. Fourth, commercial fishing and commercial aquaculture are devastating the ecology of the oceans. Aquaponics could be a vehicle to halt the devastation. As it stands now, the major global fish stocks are rapidly declining and expected to collapse before the year 2050. The recent revelations concerning the use of forced slave labor on Thai fishing vessels by The Guardian newspaper in early June is a shocking reminder that we cannot continue with business as usual in the seafood industry. Although commercial aquaculture could be a wise alternative, in practice, it too, is ecologically destructive. Many commercial fish farms treat their fish much like commercial cattle lots. They use severely overcrowded tanks which lead to disease, excessive use of antibiotics, and dumping of concentrated waste and chemicals into surrounding environments. Aquaponics has the potential to address both the ecological and economic downsides of the commercial seafood industry. If this isn't just so much hype, why don't we see aquaponic devotees setting up shop on every corner? I think part of the answer is that most of us don't have the confidence of an accomplished plumber. We start feeling a seeping defeat, when there's a leak. And an aquaponics system needs more oversight than a pet. If the water quality goes out of whack, plants and/or fish might die. In developing countries, especially in rural areas, it may be hard to come by the electricity and electronics that make it much easier to circulate water and control its flow, its PH levels, its temperature, and its oxygen levels. If these things can be accomplished, aquaponics truly holds great promise. Geoff Lawton, a permaculture designer, says that "All the world's problems can be solved in a garden." The Urban Farming Guys are proving his point, even with no real budget to work with. Where I live, when we have what seems an insurmountable, poverty-related problem, local governments will hire a consultant or do some kind of study. This will generate many dissenting opinions that will result in calling in the consultant once again or doing a follow-up study. After spending tens of thousands of dollars, the problem has probably degenerated a bit, but we may be ready to actually start fixing it. The Urban Farming Guys just dove in and started offering up solutions to the problems of the inner-city. And the community responded with enthusiasm. With great entrepreneurial spirit and technological savvy, they are now generating some income from their efforts. There are so many difficult places on earth where efforts to create a sustainable future are desperately needed. If you'd like to volunteer, intern or apprentice with The Urban Farming Guys, participate on their forums, or donate to the cause, click here.